For a Christian, Jesus is the ultimate fulfillment of these Feast Days. He became the Paschal Lamb, actually being crucified on the day that Israel prepared their Passover Lambs. So Jesus fulfilled Passover with His Death. Jesus is the First Fruits of the Resurrection and the day He rose was the same day that the High Priest waved the sheaf offering as a symbol of offering the first fruits of the spring harvest to God. (The High Priest did this on the day after the Sabbath which followed Passover). Finally, Pentecost rounds out the Spring Feast Days. It is 50 days after Passover. It is called the Feast of Weeks and Israel celebrated the Spring Harvest. Jesus fulfilled Pentecost by sending the Holy Spirit and brought in a harvest of 3000 souls to the Father. May the face of the Lord shine upon you always. We have seen that Jesus has perfectly fulfilled the Spring Feast Days with his crucifixion, Resurrection, and giving of the Holy Spirit. So it is with this knowledge that I believe that Jesus will fullfill the Fall Feast Days with regards to his 2nd coming (Parousia). How do I know this? GOD NEVER CHANGES! There are 3 scriptures (the perfect witness) that supports this. May the Light of God’s Word guide you to everlasting life. 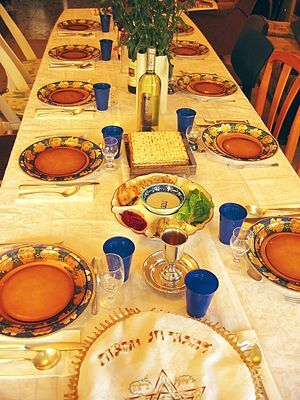 Tonight at Sundown begins PESACH SHENI (2nd Passover). For Israel, in the days of the Exodus, some were ceremonially unclean or away on a journey and couldn’t properly celebrate The Passover. So this is what God told Moses. Yahweh is the God of Mercy. He is patient and long-suffering and wants all of His children to share in knowing who He is. Despite what people may think, God is not done with the Jewish people. In fact, the spiritual veil that was placed over their eyes (due to a hardness of heart) will soon be removed. (Cf: Romans 11:25), A major event will begin the lifting of the veil and I believe that is when the Anti-Christ desecrates the altar in the Jewish Temple with an abominating sacrifice and claims to be god. (Daniel 9:27, Matthew 24:15, 2 Thessalonians 2:4). Those who trusted him (anti-christ), but have a heart for Yahweh will suddenly know the truth. That truth will lead to knowing Jesus as Messiah and Lord. May the Prince of Peace bless you and your families and establish you firmly in His Kingdom. Today is an important day for believers in Christ. It is Pentecost. This day celebrates the outpouring of the Holy Spirit on people from many nations who came to Jerusalem. Pentecost was a harvest of souls and was a “NEAR” fulfillment of the prophecies in Joel 2:28-32. The Jewish people celebrated Pentecost from sundown this past Tuesday til sundown on Wednesday (May 14th and 15th). This Holy Day is also called Shavout (Feast of Weeks) and it is an offering of first fruits ti Yahweh. As Pentecost is 50 days from Resurrection Sunday, Shavout is on the 50th day from the waving of the sheaf offering (by the high priest). (Leviticus 23:15-21 and Deuteronomy 16:9-12). In the Acts, Chapter 2, The Holy Spirit came down on those who were celebrating the Feast of Weeks. This is the Spring (Wheat Harvest). Jewish tradition also says that Moses was given the 10 Commandments on Pentecost. I personally believe that this is likely. God, speaking through the prophet Jeremiah, spoke of a time where he would write His Law on the Hearts of His People. (Jeremiah 31:31-34). The giving of the Holy Spirit, in Acts 2, was a near fulfillment of that promise. Look for a “FAR” prophetic fulmillment of this promise to come in the near future. May the Love of Christ reign in your hearts. Numbers 29 goes into detail about the different types of offerings required. What is interesting to me is that in verse 5, a male goat was required for a sin offering to atone for the individual’s sins. This was the first step that God’s people had to take towards self-inspection and repentance. God would then make the decision to accept or reject the atoning sacrifices on the tenth of Tishri, the Day of Atonement. (Yom Kippur). 1 Tishri was also the only feast Day of Israel that included the offerings for the New Moon. On the first of every month, Israel had to give a new moon offering (which also included a male goat as a sin offering). (Numbers 28:11-15). All the offerings for this feast day were a pleasing fragrance to the Lord and they were an offering by fire. There are significant propetic overtones to these sacrifices as seen in Revelation 8. The Strong Angel of Revelation, using the golden censer, would offer up incense to the Lord along with the Prayers of the Saints. These heartfelt prayers were always pleasing to Yahweh and their sacrifices came through the fire of affliction. The prayers of the Souls under the Altar (Rev 6) is an example of this. In conclusion, the Feast of Trumpets was: a gathering of God’s people, a day of complete rest and joyous acclimation. It was a time to praise the Lord but also to recognize the need for His mercy due to the sin that blemished each person’s life. This Feast Day truly embodies who Jesus is because He gives us rest from the tribulations of life. Jesus also is the Spotless Lamb that blots out our sin when we turn to him humbly and truthfully. It also reflects the joy God’s People should have when they are delivered out of grave danger by Jesus. May the Lord Bless you and keep you and may His Countenance shine upon you. The days that Jesus is referring to are the days of Great Tribulation at the hands of the anti-christ. The Rapture cuts short the persecution of the elect, before the 70th week of Daniel ends. A main teaching of the Pre-Wrath Rapture is that The Rapture occurs on the same day that “THE DAY OF THE LORD BEGINS”. This day, which I believe to be a yr. long, has been mentioned by the prophets as a day of disaster for the ungodly and a day of redemption for the people of God. We also know from Rev. 6:9-16 that God’s judgment won’t begin until the full number of martyrs are brought into the fold. Then the sun will be darkened and the moon will no longer give its light as the stars are shaken. ( Matthew 24:29, Isaiah 13:10, Isaiah 34:4). No other day but the Rapture of the Elect matches the above events. The last blog showed that the Feast of Trumpets was a gathering of God’s people, commemorated by the blowing of Trumpets and celebrated with joyful shouts. 1Thessalonians 4:13-17, (which is agreed by prophet scholars to be the definitive teaching on the Rapture) shows that a Command from God and a Trumpet blare from the Arch-angel, brings God’s elect to the Lord. Then from Revelation 7:9-10, we learn that this great multitude will proclaim God’s Glory with joyful shouts. John is told that these people have just come out of the Great Tribulation.(7:14). In conclusion, we see that the Rapture is a gathering of GOD’s people brought together by a Trumpet blast and a gathering of past and present saints. For the elect it is a time of joy. For the anti-christ’s followers, it will be a time for the Wrath of God. The pattern of Rescue and Judgment is seen just as it was during Passover. May the Lord Strengthen you in these last days.